“Hass Coast” is a propagandist for ISIS who purportedly lives in ISIS-held territory. 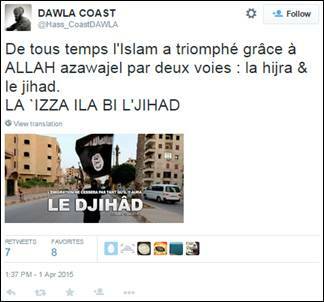 On Twitter, Coast propagates pro-ISIS material, including violent imagery and extremist sentiments. The account is peppered with youthful language and symbols, with the apparent effect of normalizing allegiance to ISIS and life under ISIS rule. Hass Coast encourages viewers to make hijra (migrate) to ISIS-held territory. 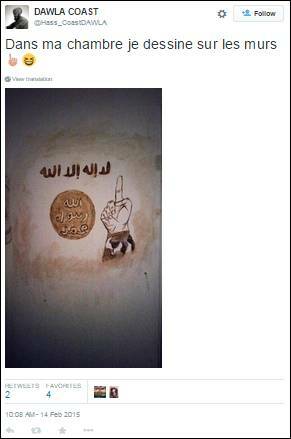 In April 2015, Coast posted a tweet encouraging migration and accompanied by a picture of an ISIS member holding a flag. 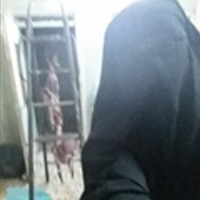 She wrote, “For all of time, Islam has triumphed thanks to ALLAH… in two ways: hijra (migration) & jihad…”DAWLA COAST, Twitter post, April 1, 2015, 1:37 p.m., https://twitter.com/Hass_CoastDAWLA/status/583367697372733440. 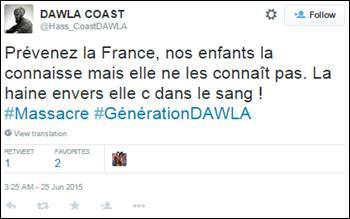 On her Twitter feed, Coast has also issued vague threats against France, writing, “Warn France [that] our children know her but she does not know them. Hate for her is in the blood! #Massacre #Generation[Islamic]State.”DAWLA COAST, Twitter post, June 25, 2015, 3:25 a.m., https://twitter.com/Hass_CoastDAWLA/status/614016665068699648. Coast also frequently talks about her husband.DAWLA COAST, Twitter post, April 1, 2015, 12:58 p.m., https://twitter.com/Hass_CoastDAWLA/status/583357822592745472. She has maintained a Facebook account.DAWLA COAST, Twitter post, December 20, 2014, 1:04 p.m., https://twitter.com/Hass_CoastDAWLA/status/546410797065584643. 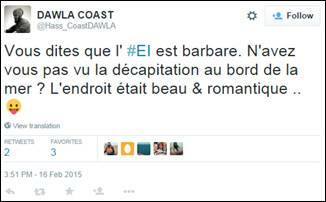 @Hass_CoastDAWLADAWLA COAST, Twitter, accessed July 22, 2015, https://twitter.com/Hass_CoastDAWLA. 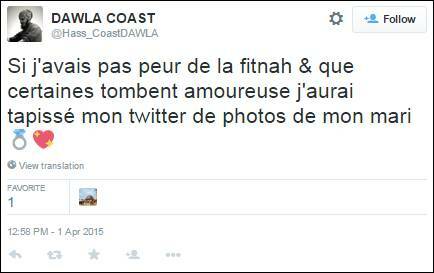 DAWLA COASTDAWLA COAST, Twitter, accessed July 22, 2015, https://twitter.com/Hass_CoastDAWLA. “Hass Coast” is a propagandist for ISIS who purportedly lives in ISIS-held territory. ”Warn France [that] our children know her but she does not know them. Hate for her is in the blood! #Massacre #GerenationState”DAWLA COAST, Twitter post, June 25, 2015, 3:25 a.m., https://twitter.com/Hass_CoastDAWLA/status/614016665068699648. “For all of time, Islam has triumphed thanks to ALLAH… in two ways: hijra (migration) & jihad…”DAWLA COAST, Twitter post, April 1, 2015, 1:37 p.m., https://twitter.com/Hass_CoastDAWLA/status/583367697372733440. “You say that #IS [Islamic State] is barbaric. Have you not seen the seaside decapitation? The place was beautiful & romantique…”DAWLA COAST, Twitter post, February 16, 2015, 3:51 p.m., https://twitter.com/Hass_CoastDAWLA/status/567471335929311232.